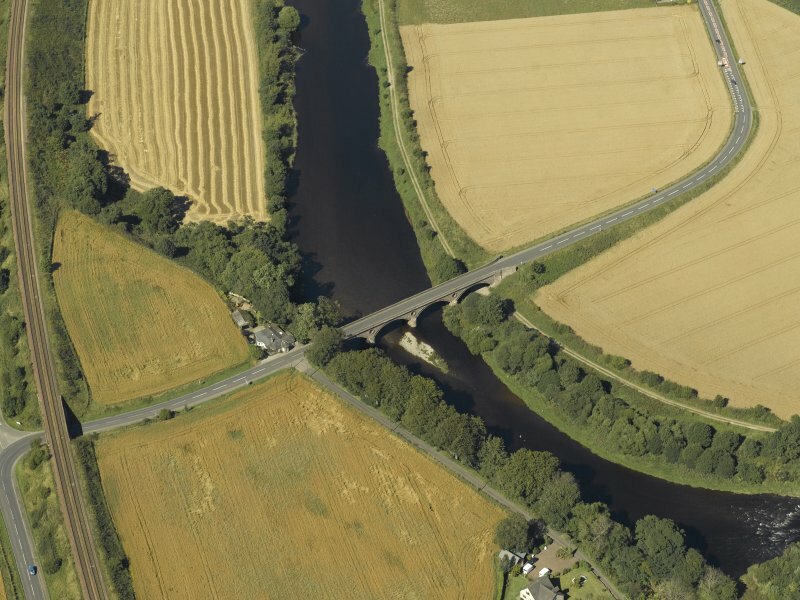 Oblique aerial view centred on the road bridge and the tollhouse, taken from the E.
Oblique aerial view centred on the road bridge and the tollhouse, taken from the S.
Oblique aerial view centred on the road bridge and the tollhouse, taken from the NW. 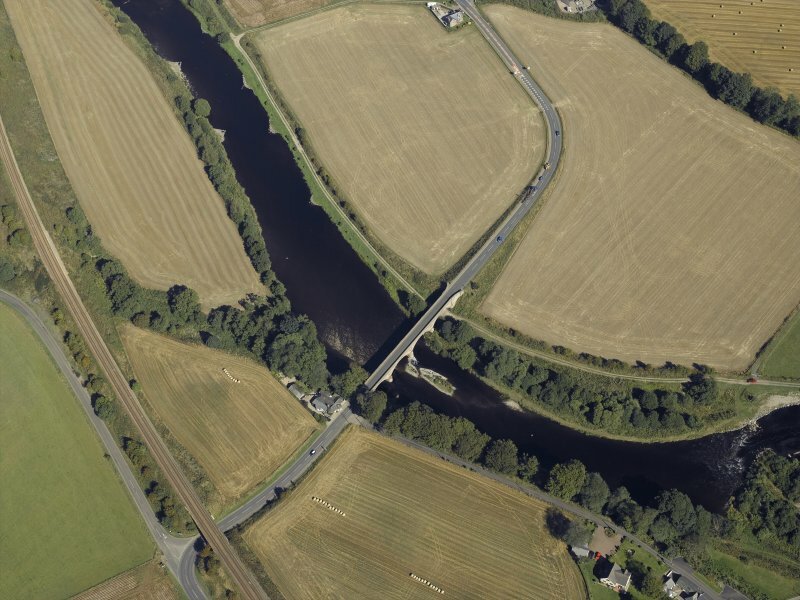 Oblique aerial view centred on the road bridge and the tollhouse, taken from the SE. For adjacent tollhouse (on S side of river), see NO66SE 45. 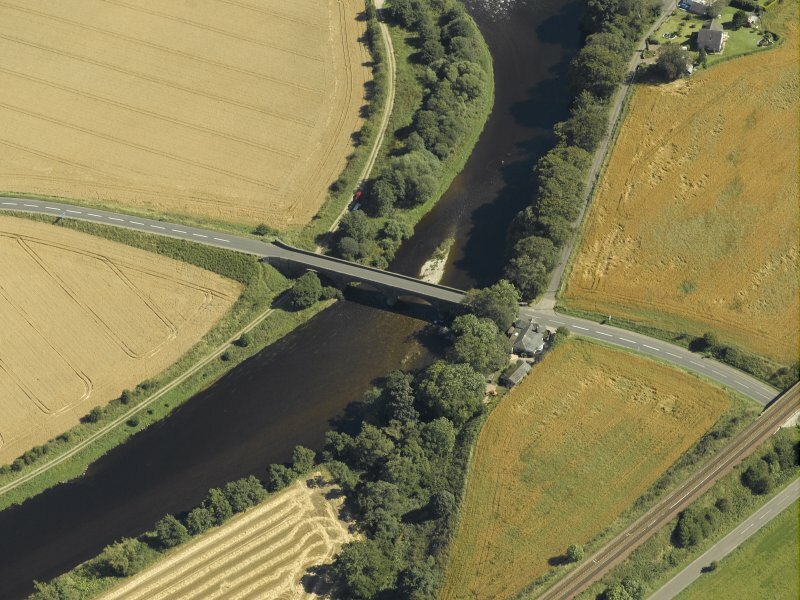 For corresponding railway viaduct (upstream), see NO66NE 65. 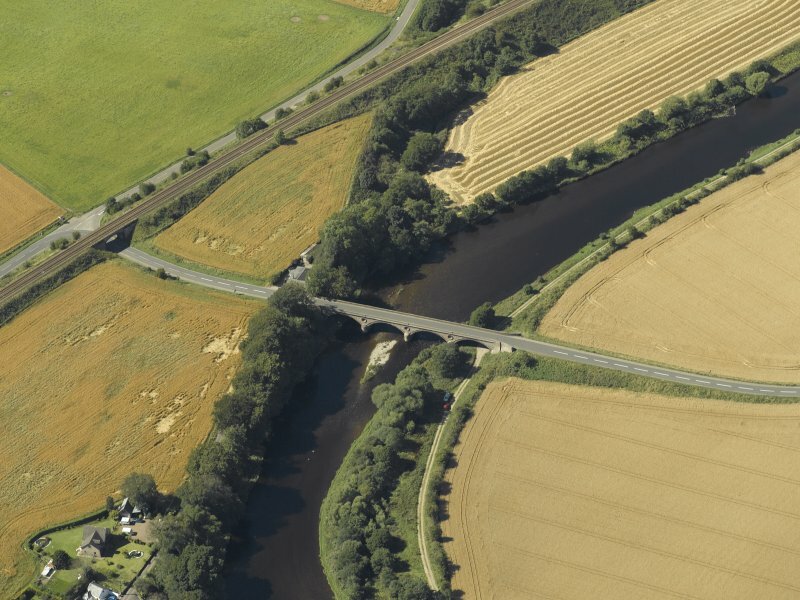 Not to be confused with Upper North Water Bridge (NO 65271 66139), for which see NO66NE 25. 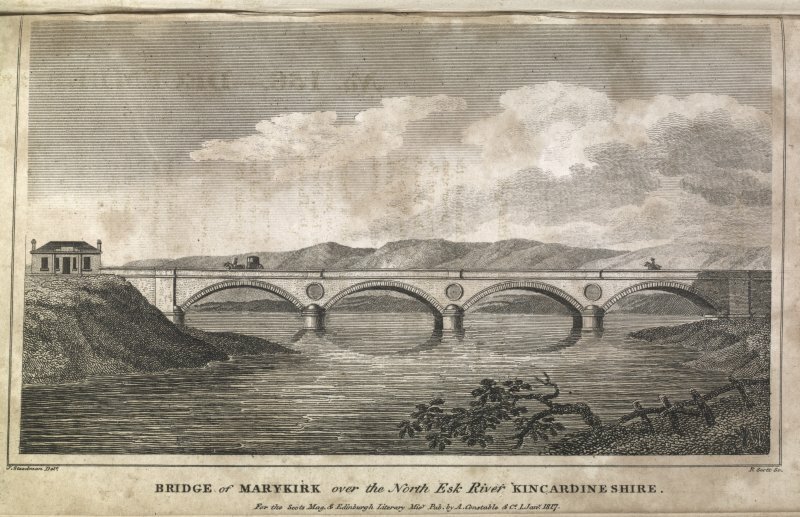 Marykirk Bridge (HBD No. 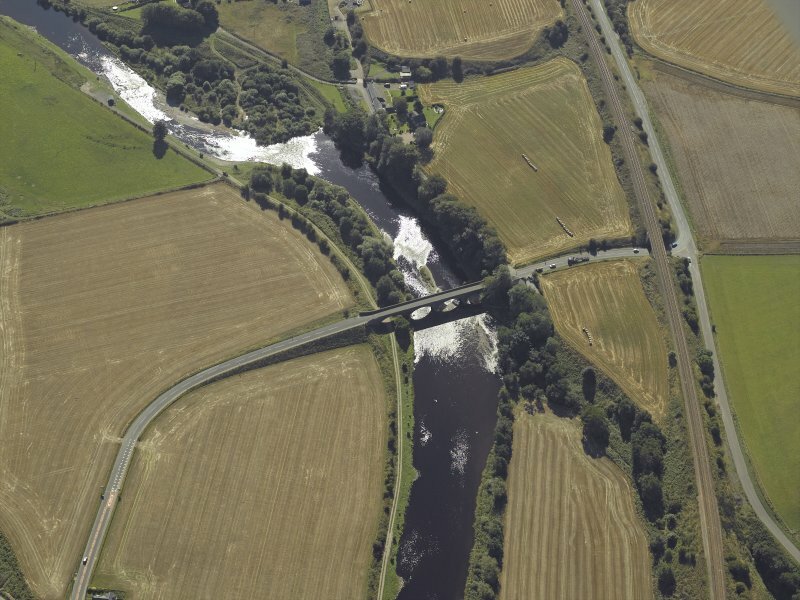 7) North Water Bridge (cf NO66NE 25): Built 1814, engineer Robert Stevenson. 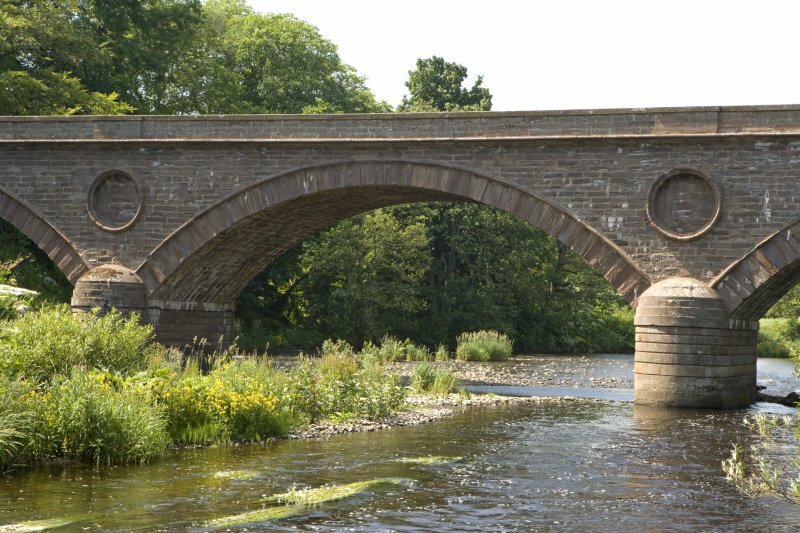 A very handsome four-span bridge, with massive dressed stone arch-rings and coursed rubble spandrels with wing walls. 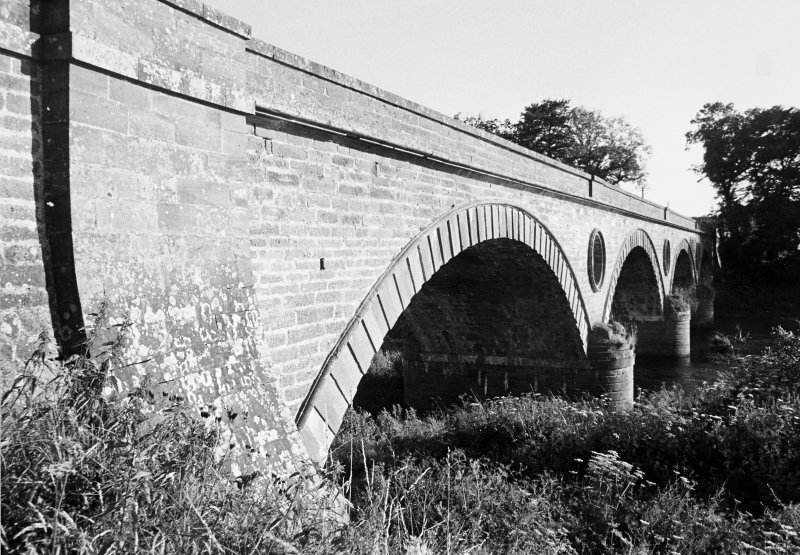 There are rounded cutwaters, and occuli in the spandrels between the spans. 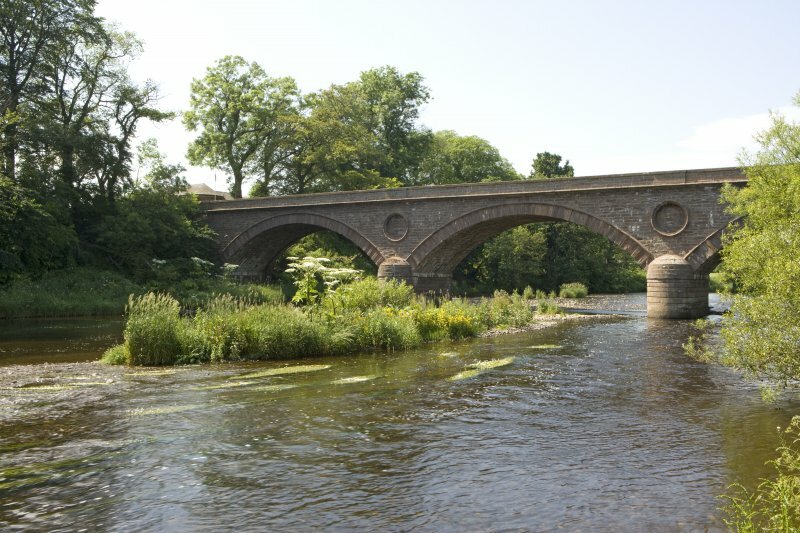 Marykirk Bridge, 1811-14, Robert Stevenson. 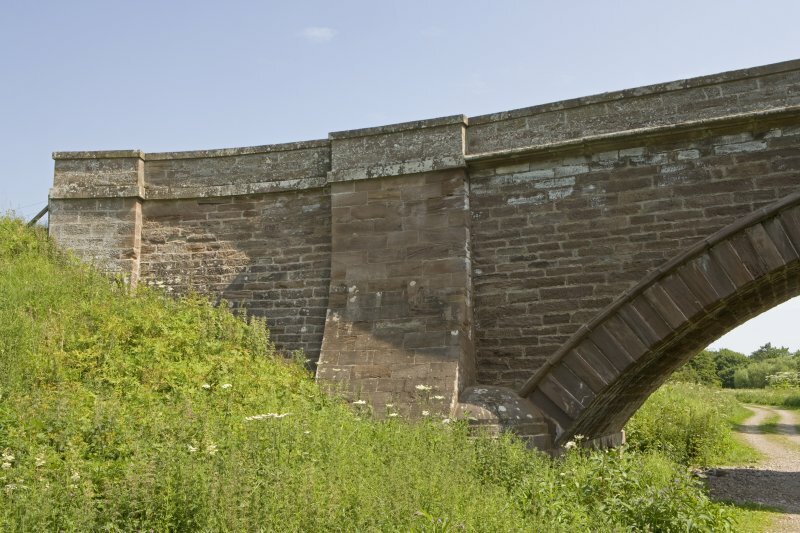 Four segmental arches, with recessed circular panels in the spandrels, and fine ashlar cutwaters. 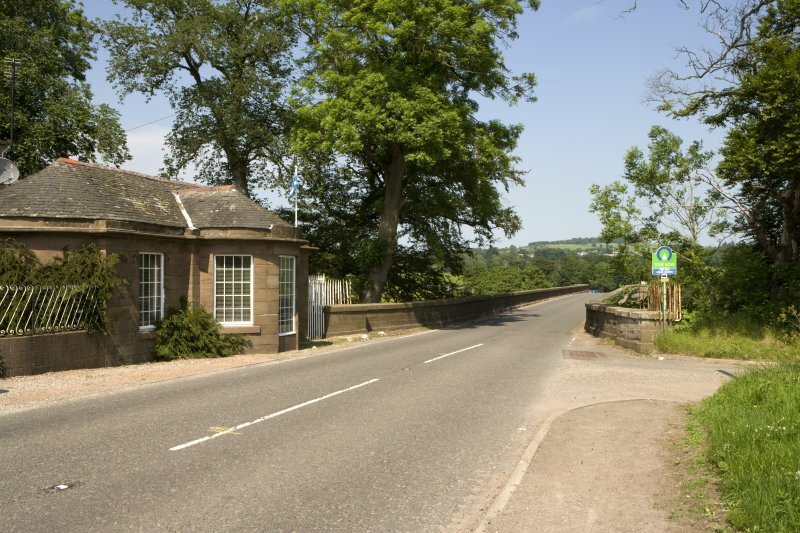 This bridge carries the A937 public road over the River North Esk to the SW of Marykirk village (NO66NE 51). 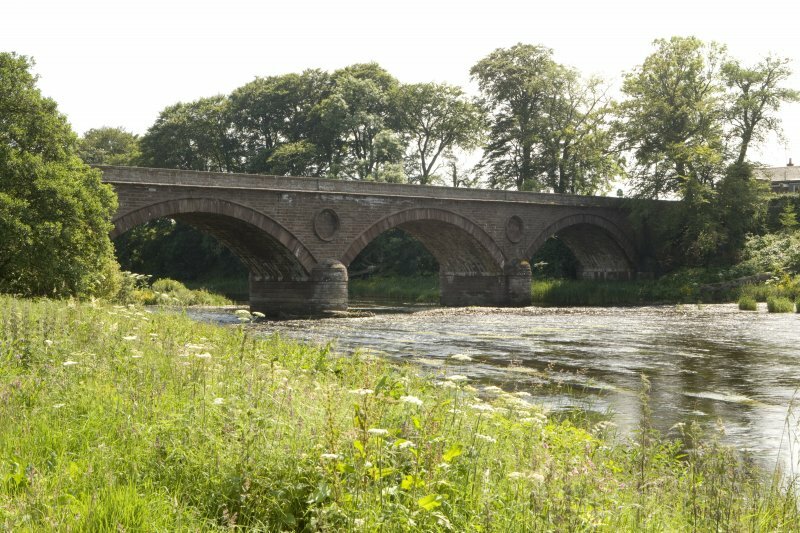 The river here forms the boundary between the parishes of Logie Pert (Angus) and Marykirk (Kincardineshire), to the SW and NE respectively. The location assigned to this record defines the centre of the structure. The available map evidence indicates that it extends from NO c. 68633 65048 to NO c. 68573 64982. Information from RCAHMS (RJCM), 11 April 2006.
early in 1811 had started work on this project. 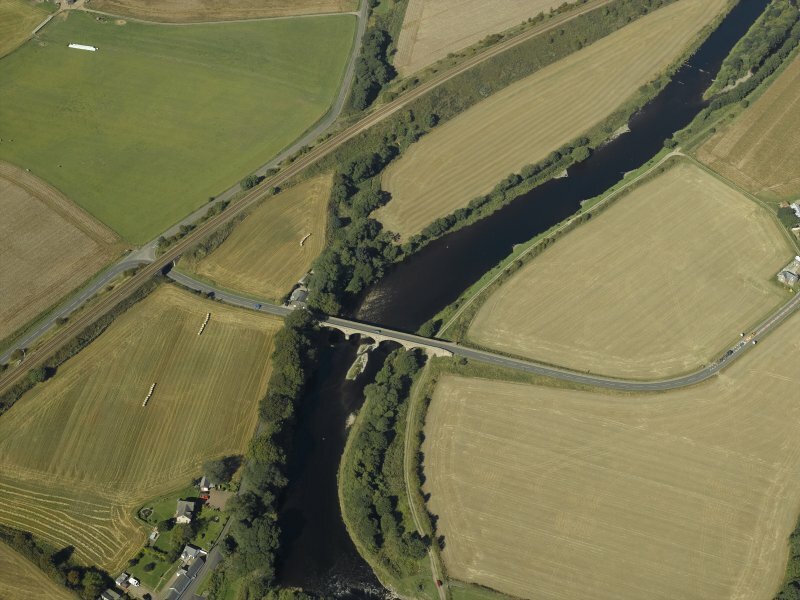 Logan set out the work in December 1811 and when Stevenson visited the site with him in the following July, the south abutment was up to low water mark and because of the war with France some of the workmen were ‘absent on duty with the local militia’. in 1814. The contractors were Ross & Smith and the estimate £7266. The out-turn cost was about £10 000. The view, which shows the toll house, is from a drawing by Stevenson’s chief assistant John Steedman. 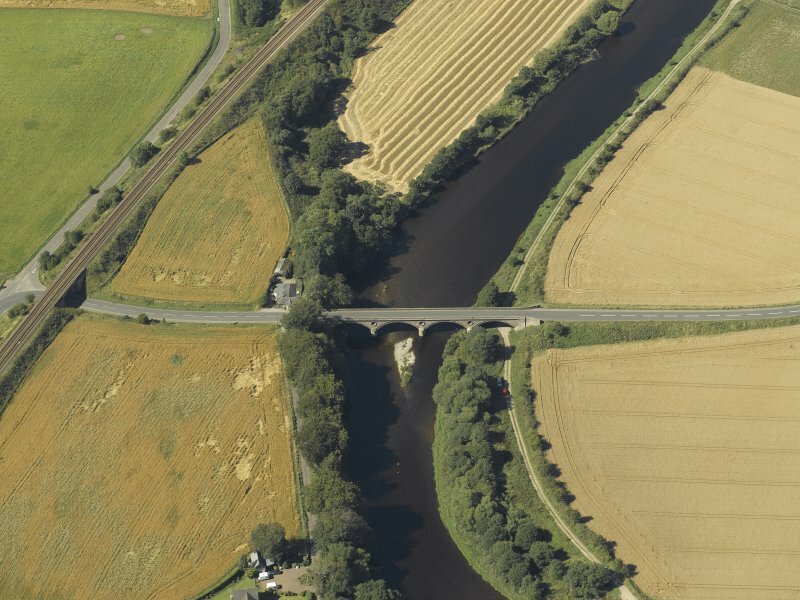 This bridge undoubtedly influenced the design of Stannochy Bridge near Brechin. Reproduced from 'Civil Engineering heritage: Scotland - Highlands and Islands' with kind permission of Thomas Telford Publishers. 1811-14 by Robert Stevenson: 4 segmental arches and circular recesses in the spandrels. It was built by the team that had just built the Bell Rock Lighthouse. The 13-span railway viaduct just to the north has steel trusses of the late 1880s in place of the original timber arches of 1849. The cast iron shoes for the timber arches are still there. See Angus for Craigo.